Porsche is putting an automatic in the 911 GT2 – and we have the video to prove it. Porsche’s next incarnation of the 911 GT2 supercar will sprout a pair of flappy paddles behind its steering wheel, with video of a GT2 prototype undergoing testing at the Nurburgring Nordschliefe revealing the presence of a quick-shifting PDK automatic transmission. Having an auto between the rear wheels (or more correctly in the PDK’s case, an automated dual-clutch manual between the rear wheels) will be a first for the GT2, which has been a manual-only offering since 1993 when the first fat-fendered GT2 burst onto the scene with the 993 generation 911. But with the 991 GT2 expected to have more than 400kW exploding from its twin-turbocharged 3.8-litre flat-six, putting a PDK auto between it and the driven wheels is probably a good idea. Take the burden of shifting gears manually away from the driver, and the odds of them making an unscheduled trip into a hedge is dramatically lessened. It’s a strategy that Porsche employed for the 911 Turbo and 911 GT3 RS, though Porsche appears to be willing to offer the GT3 with a traditional three-pedal manual in the next generation, as it did in the 911 R. The high-powered Turbo, however, will likely remain PDK-only – and judging by the audio of this video, the next GT2 will also transition to a two pedal configuration. Beyond the lightning-fast speed of its gearshifts, we can also witness prominent arch extensions containing the GT2’s massive wheel and tyre package, with equally sizable carbon-ceramic braking hardware contained within. Mega-sticky Pilot Sport Cup 2 rubber keeps this prototype glued to the track, and the aero package appears to be a mixture of 911 Turbo S and 911 GT3 RS parts. The GT2 prototype’s rear wing is the same as the GT3 RS’s Boeing-sized element, while the front bumper is also GT3-based. 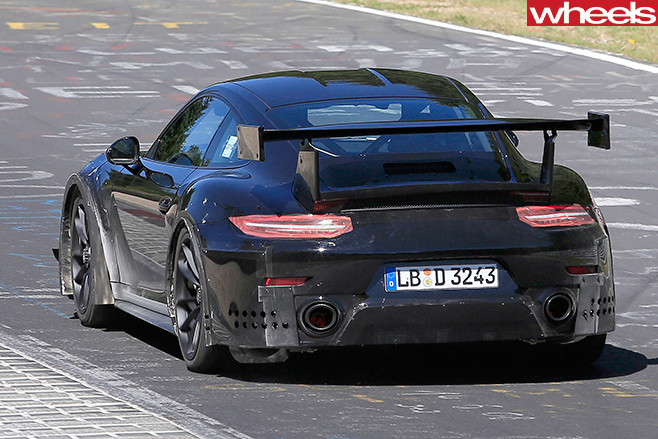 The GT3 RS’ distinctive front fender vents are present, but taped up on this car to render them inactive. Porsche hasn’t raided the parts bin entirely though. This prototype wears downforce-enhancing front canards on the sides of its front bumper, the side air intakes for its twin intercoolers feature prominent scoops and there are the aforementioned wheel arch flares. 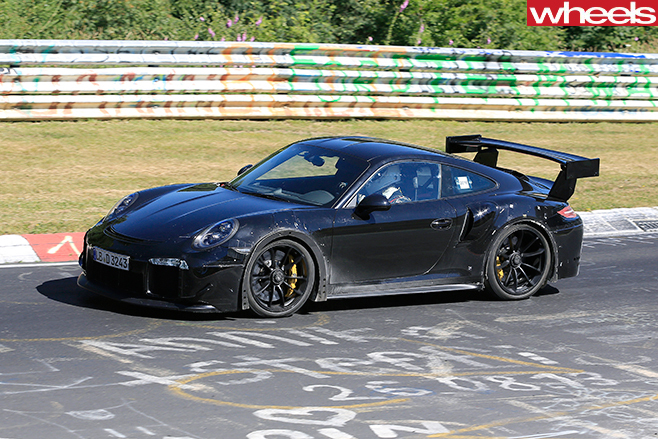 Will the next 911 GT2 retain the rear-drive configuration that’s been a GT2 hallmark thus far? We don’t know for sure, but if this video is anything to go by it will be very, very fast indeed.